Wash and rinse the rice 4 times. Soak it in water and set aside for at least 30 minutes. In a saucepan over medium heat, add 1/3 cup oil and fry the onion until brown in color. Remove onion from oil, preserving the oil. Add onion to a blender. Add 3 tablespoons water to the blender and blend until smooth. Set aside. In a large pan, heat the remaining oil from the onion over medium heat. When hot, add the chicken thighs. Brown the chicken thighs, cooking 3-4 minutes on each side. Add the blended onion, garlic, salt, garam masala, cumin and cinnamon. Mix well. Add 1-1/2 cups of hot water, let the mixture simmer about 15 minutes until the chicken is cooked. When around 1/4 cup water is left in the pan, remove the chicken and set aside. Add remaining 3 cups of water to the pan, when it comes to a boil add the rice. Reduce heat to low, cover the pan, and cook for 35 minutes. Add 3 tablespoon oil to a frying pan and shallow fry raisins and walnuts for 3 minutes over medium heat. Remove and set aside. Add carrot and cardamom powder, fry for 3 minutes. 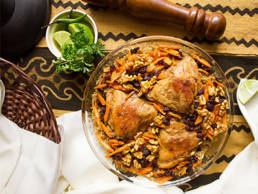 To serve, dish the rice on a big plate, add the chicken and garnish with fried carrots, raisins and walnuts.